This furniture and equipment lease agreement pertains to furniture and equipment for a truck stop. It gives the operator of the truck stop (the lessee) the right to use those personal property components in the truck stop business. This furniture and equipment lease is designed to accompany a separate coterminous lease of the truck stop real estate held by an affiliate of the equipment lessor. The lease contains exhibits for a rent schedule for the rent payable for the furniture and equipment, the legal description of the property, a schedule of equipment liens, and a schedule for applicable equipment warranties. During the term of the lease, the lessee must maintain insurance and pay all taxes on the furniture and equipment covered by the lease. Separate Real Estate Lease Contemplated This furniture and equipment lease is designed to accompany a separate coterminous lease of the truck stop real estate held by an affiliate of the equipment lessor. Two separate affiliated entities own the real estate and the equipment. 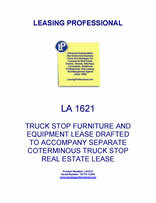 THIS FURNITURE AND EQUIPMENT LEASE AGREEMENT (the "Lease") is made and entered into as of ______________, 20__ (the "Effective Date") by and between MODERN TRUCK STOP EQUIPMENT OWNER, a __________ corporation ("Lessor"), whose address is __________________________________, ("Lessor") and TRUCK STOP OPERATOR, a __________ corporation ("Lessee"), whose address is _________________________________. 1. LEASE AND DESCRIPTION. Lessor hereby leases to Lessee, and Lessee hereby leases from Lessor, in consideration for the rentals herein described and the terms, covenants and conditions set forth herein, all furniture, fixtures, trade fixtures, machinery, equipment and other personal property owned by Lessor (the "Equipment"), as more particularly described in Exhibit A attached hereto and made a part hereto, it being intended that the Equipment include all personal property used or useful in connection with the operation of the Modern Truck Stop situated on the real property located at ____________________, __________, __________ County, __________ and being more particularly described on Exhibit B attached hereto and made a part hereof (the "Real Property"). Contemporaneously with the execution of this Lease, MODERN TRUCK STOP PROPERTY AFFILIATE ("Property Affiliate"), a _________ corporation affiliated with Lessor, as landlord, and Lessee, as tenant, have entered into a Lease Agreement with respect to the Real Property (the "Real Property Lease"). It is intended that this Lease be coterminous with the Real Property Lease, and any termination of the Real Property Lease shall be deemed to automatically effect a termination of this Equipment Lease. 2. TERM. The initial term (the "Initial Term") of this Lease shall be for a period of ten (10) years, commencing __________, 20__ (the "Commencement Date") and terminating on __________, 20__, subject to extension or early termination as herein provided. On the Commencement Date, Lessor shall deliver sole and exclusive possession of the Equipment to Lessee. Lessor hereby grants to Lessee, in addition to the Initial Term, the option to renew this Lease for two (2) additional terms of five (5) years each (each a "Renewal Term"), subject to and on the same terms and conditions as herein provided. Each Renewal Term shall be exercised at the election of Lessee by the tender of written notice of Lessee's intention to extend this Lease not less than ninety (90) days prior to the expiration of the Initial Term or the then current Renewal Term, as applicable. Notwithstanding anything to the contrary contained herein, including without limitation that the Commencement Date shall be subsequent to the Effective Date of this Lease, it is the intention of Lessor and Lessee that this Lease be effective between the parties as of the Effective Date and that as of such date, that each of Lessor and Lessee have their respective rights and obligations hereunder. 3. RENTAL. Lessee is obligated to pay the Rent to Lessor as defined and specified in Exhibit C attached hereto. Landlord and Tenant agree that the Rent and all payments to be made to Landlord hereunder are to be net to Landlord, without deductions or offsets of any kind or nature whatsoever. In no event shall there be any abatement or reduction in the Rent except as may be otherwise specifically provided in this Lease. 4. WARRANTIES AND REPRESENTATIONS. Lessor warrants and represents that it has title to the Equipment free of any liens and encumbrances, except as set forth in Exhibit D attached hereto and made a part hereof (the "Equipment Liens"), and that during the term of this Lease, provided no event of default has occurred hereunder, Lessee's use of the Equipment shall not be interrupted by Lessor or anyone claiming through or under Lessor. Lessor hereby warrants and represents that (i) the Equipment is in working order and in good condition and repair; (ii) the Equipment has been maintained in accordance with good business practices and specifically in accordance with the terms of any guaranty or warranty applicable thereto; (iii) Lessor has used the Equipment in the manner in which it was intended to be used, consistent with all operating manuals and procedures, and otherwise in accordance with all federal, state, and local laws, ordinances, statutes, codes and regulations ("Applicable Laws"); and (iv) the Equipment is suitable and fit for use for the purposes herein leased and the use intended with regards thereto by Lessee. Lessor further warrants and represents that all manufacturer's, vendor's, or dealer's warranties and guarantees applicable to the Equipment are described on Exhibit E attached hereto and made a part hereof (the "Warranties") and that all such Warranties are in full force and effect as of the Effective Date. Lessor authorizes Lessee to assert for Lessor's account, during the term of this Lease, all of Lessor's rights under any such Warranties. Lessor warrants and represents that any Equipment not in proper working order as of the Commencement Date will be immediately repaired or replaced at Lessor's expense. Specifically, Lessor warrants and represents that that certain Lease Agreement referred to as _______________ dated as of __________, 20__, by and between Lessor and Equipment Finance Corporation (the "Equipment Finance Lease") with respect to certain equipment described thereunder is in full force and effect and there have been no amendments or modifications to the terms and provisions of said Equipment Finance Lease. Lessor hereby warrants and represents that as of the date hereof no event of default has occurred under the Equipment Finance Lease and no condition exists which with the giving of notice, lapse of time or both or otherwise would constitute such an event of default. Lessor warrants and represents that it will continue to fulfill its obligations under the Equipment Finance Lease and that at the expiration of the Equipment Finance Lease term on ________, 20__, Lessor will immediately exercise its purchase option under said Equipment Finance Lease. In the event an event of default occurs under the Equipment Finance Lease as a result of Lessor's failure to fulfill its obligations under the Equipment Finance Lease, Lessee shall have the right to cure such default and offset such amounts against future rental installments (as set forth in the Real Property Lease) as the same become due and at Lessee's option, pursue any other remedy available to it at law or in equity. (a) During the term of this Lease, Lessee shall use the Equipment in the conduct of Lessee's business and in compliance with all Applicable Laws. (b) Subject to the provisions of subparagraph (d) below Lessee, at its expense, will repair and maintain the Equipment in the condition received from Lessor, ordinary wear and tear and damage by casualty and condemnation excepted. (c) Lessor shall have the right at all reasonable times, subject to providing reasonable prior written notice to Lessee, to inspect the Equipment. (d) In the event that during the term of this Lease the Equipment, or any portion thereof, shall become obsolete, inoperable, unusable, unfit for use or out of repair, and the repair in the opinion of Lessee is not consistent with the best interest of Lessee's business, Lessee may relinquish such portion of the Equipment to Lessor, making the same available to Lessor at the Real Property. In such event Lessee shall give Lessor written notice of its intention to replace such portion of the Equipment and thereafter Lessor shall have a period of fifteen (15) days within which to remove the same from the Real Property, at its sole cost and expense. In the event Lessor fails to reclaim and remove the Equipment within such fifteen (15) day period, Lessor shall be deemed to have abandoned the same and thereafter Lessee shall be free to dispose of such Equipment as Lessee chooses without any obligation or liability to account to Lessor therefor. In the event Lessee elects to replace such portion of the Equipment or in any event install other items of personal property on or about the Real Property for use in connection with Lessee's business thereon (the "Lessee's Equipment"), Lessor, within five (5) days of the request therefor from Lessee, will execute such affidavits, confirmations, agreements, financing statements or other documents to disclaim any ownership or security interest in Lessee's Equipment. Should Lessor fail or refuse to execute any such confirmation, affidavit, agreement, financing statement or document with respect to the Lessee's Equipment, following the request by Lessee, Lessee is hereby appointed attorney in fact, and granted the power of attorney for Lessor, for the purpose of executing the same.